With any luck, Moynihan Station will finally get off the ground thanks to last's months grant of $83 million in stimulus funds. Having gone through what seems like dozens of iterations, it's unclear exactly what shape the new station will take, but we do have one piece of advice for whatever cabal of designers takes up the massive project: Don't forget the signs. While no hardened New Yorker would admit to getting lost in Penn's warren of tunnels and concourses, Slate's Julia Turner uses the underground mess as Exhibit-A of bad signage for her series running this week and next about just how important wayfinding is in our increasingly confusing world. As Turner puts it, signage is "is the most useful thing we pay no attention to." The Jane Jacobs in all of us will point to the low-ceilings and poor layout, the ugly stepchild of McKim, Mead & White's glorious station, as the reason for the confusion Penn causes in visitors new and old alike. But Turner says the real problem, and potential solution, lies with the signage. While some of the signs work, the problem is the whole of the station, or lack thereof. The main issue, according to Turner, is that the busiest station in the country must serve three masters, Amtrak, New Jersey Transit, and the MTA (both LIRR and subways). We actually chuckled when David Gibson, principal of design firm Two Twelve, pointed out in the video above, "Here we are, we're at the intersection of three sign worlds." Could you imagine facing the same problem at busy intersection? Just as signs can create a problem, they can also fix them. As Turner points out in her third installment today, signs are already helping to take the confusion and congestion out of London's Underground—and the city in general—by directing people to stay above ground and walk, with the help of some new signs, of course. Granted Grand Central Terminal does not face the hodge podge of constraints Penn Station does, nor was it decimated by Robert Moses, but during a stroll through last night, it was clear to us how relatively easy it can be to get this right. Given how long it's taken to get Moynihan Station off the ground, and the obstinacy of transit bureaucracies to begin with, we'd be surprised if anything gets done before the arrival of the new station. Let's just hope they heed this warning and get it right next time. Transportation Commissioner Janette Sadik-Khan, Design and Construction Commissioner David Burney, Planning Commissioner Amanda Burden, and Parks and Recreation Commissioner Adrian Benepe in the plaza of the Standard Hotel. On October 22, The Architect’s Newspaper hosted a roundtable conversation with Parks Commissioner Adrian Benepe; Planning Commissioner Amanda Burden; Design and Construction Commissioner David Burney; and Transportation Commissioner Janette Sadik-Khan. With the mayoral election just a few weeks away, the commissioners discussed their priorities, upcoming initiatives, how they work together and apart, and above all, their shared determination to make high-quality design and professional involvement a priority in an ambitious administration that came to office in boom times and is now facing a prolonged recession. 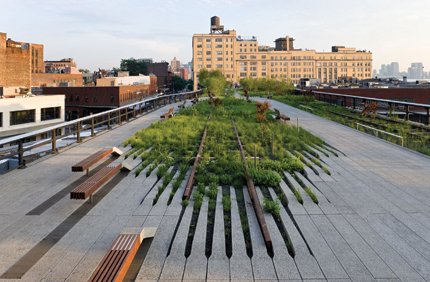 The Architect's Newspaper: The High Line has turned out to be hugely popular. What have you learned that might work elsewhere in the city or in your departments? Amanda Burden, Department of City Planning: One of the important elements is that you see the city from a completely different vantage point, close enough to see people’s faces down below, but far enough to feel a little removed from the city. I don’t think we would have imagined it that way if we hadn’t seen it completely planted, prompting the notion of a meadow in the sky, but now people are looking differently at barren tracks and barren roads as if they too might be something very special for the city. David Burney, Department of Design and Construction: What did Jane Jacobs say about how the function of the city was to offer a multiplicity of choices? I think that’s something that applies especially to New Yorkers who really respond to anything unique and out of the ordinary. Finding those treasures and uncovering them and transforming them through some kind of adaptive reuse is a New York phenomenon, and part of the explanation for the High Line’s popularity. Adrian Benepe, Department of Parks and Recreation: I think something going on very much like that is what Janette [Sadik-Khan] is doing in the streets. The only time that I ever experienced the middle of Fifth Avenue was during a parade. Overnight, she has created all kinds of new experiences on our streets. Janette Sadik-Khan: We are looking at our streets differently. We are looking at them as valuable real estate instead of one-dimensionally. For 40 years, we spent a lot of time, energy, and money creating utilitarian corridors that really maximize car usage, and now we’re reimagining our streets as the real estate they are and taking a look at how we can use them differently. Benepe: The other day I got through Herald Square faster than I ever have before. It’s counterintuitive, but by closing down some streets, things do move more smoothly. Sadik-Khan: My big takeaway from Times Square is that when we did it, we figured out how to make it wonderful in terms of conditions, but we hadn’t planned for programming. So we came up with the idea of beach chairs and ended up going to a discount hardware store to get them. It looked like it was a brilliant move, but it was very short and quick to happen. People spent so much time thinking about the beach chairs, and not the project, that I think a strategy going forward for the city is to put lots of beach chairs out for whatever project is going on, and people will only talk about the beach chairs. That brings up a hot topic among architects and designers. What other kinds of temporary or not-quite-permanent design plans do you see happening? Benepe: An interesting thing at Brooklyn Bridge Park is, of course, the great Michael Van Valkenburgh design about to open. But long before the actual construction started, back when we knew we were going to have the Waterfalls art exhibit, Susannah Drake—a landscape architect from the area—did a pop-up park overnight that was hugely successful. 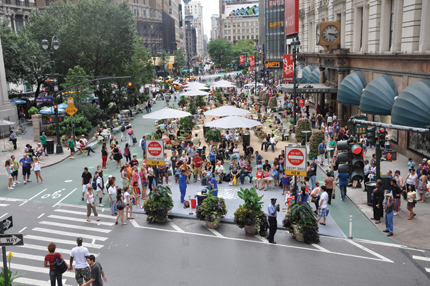 It just shows how almost any space in New York can be a public space. We can do these insta-spaces, see how they work, then bring in the architects. But I think the real key to any long-term success is having good architects and landscape architects. 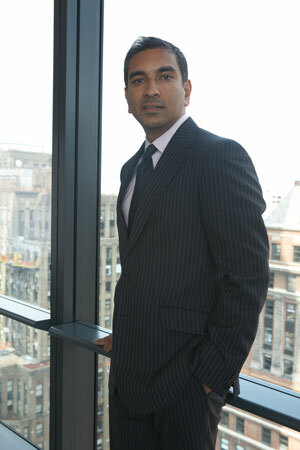 Sadik-Khan: We were trying to give the notion of a greater, greener New York really quickly. I think New Yorkers are tired of waiting decades for projects to happen. We wanted to show what a different approach to transportation is about, using paint, planters, and plastic markings. But we also did work with Billings Jackson and Pure+Applied on the designs. We have a very strong design team in the department, too. Burden: Both Broadway and the High Line have shown that we are finally a city that is providing great spaces for socializing in our public realm. And just by giving people a nice place to sit, they begin to populate places they never thought about populating. Burney: There are challenges. Look at Astor Place, where they are trying to introduce more seating in an expanded plaza. As often happens, there is one constituent saying, “No we don’t want students here drinking beer.” It’s an education process, and we have to work on that. Sadik-Khan: New York City is largely a city without seats, and so Amanda and I went over to Copenhagen and met with Jan Gehl, a well-known architect, planner, and designer who has done terrific work making recommendations to transform cities like London, Paris, and Abu Dhabi, and we brought him back to New York to help work with us. He did a public-life survey on the streets, analyzing Broadway, from 59th to Houston streets. First of all, he found that down that whole corridor, about 30 percent is covered in scaffolding. And that’s a nightmare, so we are working with Bob LiMandri at the Buildings Department on a design competition for better urban sheds. The second piece of news was that there was no seating, and there were only three outdoor cafes in that entire stretch. So we’re working on that, now, too. When you have a strong idea, what do you have to do to make it happen? Benepe: I think one of the things that liberates all of us to do interesting things is having a mayor and a deputy mayor who think good design is important. Without casting aspersions on previous administrations, I don’t think we’ve had an administration before that thought about urban design at this level—and not only allows it, but insists on it. The Design and Construction Excellence program began in this administration; the Public Design Commission is empowered to insist on good design. They wanted to make it possible for the city to hire great architects and designers who had previously, for whatever reason, been scared away from doing city work, or couldn’t get it, or faced a system that wasn’t set up for them to get it. Now the belief across all the agencies is that we should have great design. Burden: Each one of us has incorporated the ideas of design excellence. We use it at city planning, because we feel it is the best way to communicate with the general public. All of our rezonings are very complicated—and we just celebrated our 100th one affecting 8,400 blocks—but none of those would have happened, or been adopted, if we didn’t have community consent. So instead of just drawing the zoning map, with me saying you are going to get T64-a—which you’ll vote against, because you don’t know what it is—we have an urban design team that draws all the zoning plans in three dimensions. That’s how we sell, convince, and engage the community with urban design master plans. It’s a much better communicating tool; the feedback we get is much better, and it’s easier to find workable options. It’s exciting for young architects to see how each of your departments has revitalized design offices. Is there a lot of crossover in what you do? Burney: We have engaged this whole portfolio of younger, smaller firms that is really unprecedented and very successful, just by changing the method of procurement. If you look at almost any of these projects, there are parks elements, planning issues, and DOT matters, so we sometimes end up discussing even the smallest details for weeks: The guardrail at Pelham Parkway, for instance, comes to mind as an endless discussion. We are sometimes forced into these dialogues as a result of overlapping jurisdictions. But normally the way it works is that Janette’s design folks are more at the front end of the process, identifying opportunities and doing initial planning, and then it comes over to my department for details of design and how to manage the construction, and then after that over to Adrian. There are many opportunities where we have to get together and engage design firms in the process. But going forward, I think we need to spend more time on the construction side. We have done well with design excellence, we hire top-quality architects, and we’ve raised expectations for good design. But on the construction side, we are still locked into this very adversarial, sealed-bid process, and we haven’t quite got the quality-based selection process throughout our construction contractors. And so much of our work now is complex, particularly on the building side, where structures are very sophisticated, emerging systems are so complex, and so many sub-trades are involved. If you’re not working as a design and construction team from the very beginning, you’re in trouble. Benepe: We do need some kind of construction procurement reform, because it is becoming increasingly difficult to build things in New York. Sadik-Khan: I also think we need to do a better job when we are under construction, managing the impact of that construction on the street. And we are doing a lot of work to up our game, with competitions for art around construction sites. And we’re working with students and design teams on Jersey barriers for roadways. Must they look so ugly all the time? Do we have to have the world’s most hideous sheds casting terrible shadows and creating dangerous spaces around the city? In other cities like Montreal, they have curtains showing what the building will look like. I mean, we’re a world-class city, and we need to have world-class treatments. Even if it seems like everything is under construction at the same time, it doesn’t have to be so grim. Burney: I know, let’s close all the streets to traffic to get the thing done on time! 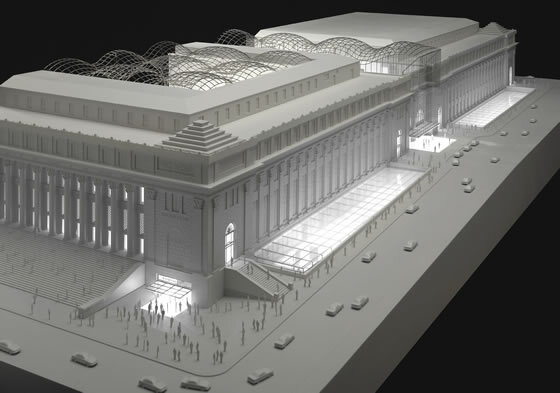 Do you see integrated modeling like BIM becoming key to how the city undertakes projects? Burney: BIM has gained a lot of traction in the design field even at the small firms now, and there are a lot of consultants who specialize in modeling. On the design end, where there’s a lot of integration of mechanical and electrical systems with the architecture, it’s quite well established. It is less so in construction. 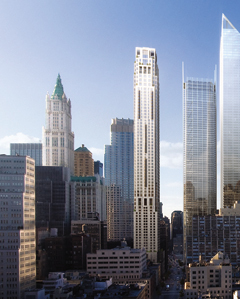 Bigger firms, the Turners and Tishmans, all have the capability to use BIM and use it to generate schedules and make two-dimensional drawings for their contractors. Smaller contractors are not there yet; the technology is expensive and sophisticated, and it will be several years before it reaches down. It is very much the future, though. Burney: We do from consultants, but not from contractors because it’s not yet realistic, though it was a requirement on the new 911 Center. Another thing, when we are doing Janette’s work—utilities, water and sewers, power cables, Con Ed data—is getting everything mapped, because in most cases we have no idea what’s under the street. We’re moving to a new program to document and photograph the work before we close the street up. That’ll get mapped onto the GIS system, and then goes into the city GIS forever so we’ll know pretty much where everything is. Assuming you are all heading for third terms, what now? Is a new vision still possible in a recession? Benepe: Absolutely. We’ve all taken cuts on our capital budgets, but those cuts are against historic buildups. Even if cut by 30 percent, Parks is still spending 200 percent more than we spent before. Burney: Plus bids are down 25 percent. Benepe: I don’t know if this is true for the others, but Parks is in the midst of the biggest expansion in building since the WPA. We’ll have spent $2.5 billion by the third administration, and even with cuts we still have $2 billion in our budget: Fresh Kills, Far Rockaway; the big projects in PlaNYC are all proceeding, as are the $25 to 50 million projects. The mayor’s office has said that even in the teeth of a recession you want to keep building, because you don’t want the city to lose its vitality. And in Parks, we are still working with an A-list of architects; we have more work than we can handle with our existing resources and consultants. What’s the top priority for Parks and Planning in the next few years? 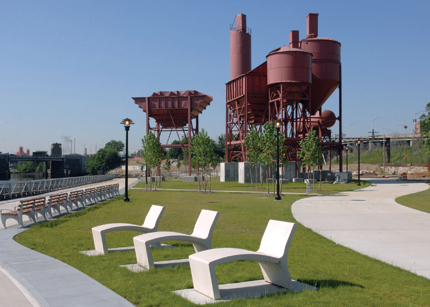 Benepe: Getting PlaNYC built, especially the eight major regional parks projects; getting Fresh Kills underway, as it still has $150 million in funding; getting Brooklyn Bridge Park finished and opened; finishing Yankee Stadium. There are also mitigation projects; filtration projects—we still have a very ambitious program and we have to figure out how to get it all done. Burden: You have to remember planning is for the long term. There are always economic crises, and the goal is to create a blueprint so at the end of the crisis we can channel growth to areas that can handle development, areas that are rich in mass transit. And also it’s important to channel away from other kinds of neighborhoods to preserve qualities there. For all of us, the citywide goal is to make New York a model for smart growth, livability, and sustainability on the neighborhood and building scale. We want to use zoning to incentivize and facilitate more high-performance, energy-efficient buildings across the city. Do you see an expanding role for your departments, reaching into new areas? Burney: Yes. In fact, coming out at the end of November is a new Active Design Guide that we did, working with, among others, the Department of Health. It will be one of the tools for fighting obesity by promoting active mobility. We kind of stumbled into it, but it addresses issues like how to maximize stair use. There’s a lot of research now on designing buildings to encourage people to be more active, by moving stairs forward, making them more attractive. It’s an issue involving all of us at the building, design, transportation, and planning levels. Where else have you been looking for inspiration? Burney: I was in Los Angeles and London recently—two completely opposite places—but what struck me about talking to government people in these two cities is how lucky we are with an administration that’s so design-focused. We have a decent amount of control of our own destiny. These other cities are so disparate in terms of who’s in charge. We control quite a lot of the public realm. Benepe: But we can’t add more land. In the 1930s, if we wanted spaces, we made landfill—we can’t do that now. You have to be courageous, because every time you repurpose a brownfield or build along the water’s edge or take an entire industrial area and make it into a new park, you have to be willing to spend money. And it takes huge sums of money and resources to build a city for the future. Burney: I think that the battle for a livable city is a constant struggle, every lot at a time, every borough at a time—the libraries, the museums, the parks, the streets, the fire hazards and police stations. Those are the things that kind of come together over time to make a really great-designed city. It’s not one big event, and you’re done. The ecologist Benton MacKaye once observed that if New York City wanted to change the traffic pattern at Broadway and 42nd Street it would require diverting the passage of goods being shipped from the United States to the rest of the world. Of course, in the 1920s, when MacKaye made this comment, more than 50 percent of all American imports and exports were passing through Manhattan’s West Side docks. Then when shipping containerization required larger storage areas than the city could provide, the docks began moving out of this tangled web of clogged streets and dense urban fabric to the looser spaces of Newark and Long Island. It was cars, not ships that dictated the next big shift on the waterfront, when Robert Moses decided to locate his modern highway system along the island’s edge. In the 1930s he created the limited-access FDR and West Side highways and until 1973, when a section of the elevated West Side road bed collapsed, those highways defined how traffic moved through the city even as they cut the population off from the most valuable open space in the metropolis, its waterfront. Since then, much has changed but the relationship of the city to the waterfront is more than ever an essential key to New York’s success. Today we are witnessing the most profound reshaping of our city edges since Robert Moses focused on moving automobiles as quickly as possible around and into the urban core. That model for urban transportation never worked very well, nor did it provide a pleasant environment for those who lived in the city. The third wave is underway, and its focus is neither on shipping nor cars but on people. We have witnessed a bold series of new designs that still provide for automobile access—like the on-grade and landscaped West Side Highway—while more significantly aiming to open up our waterfront to exciting new uses that are less noxious and friendlier to pedestrians. Modest in scale, but not in transformative power, the new bicycle lanes that circumambulate the island are encouraging people to think about using this healthier, quieter and less polluting form of transportation to commute along our riverfronts, and even as far as Governors Island and beyond. As we show in this issue, the city is bringing back two long-neglected streets along the water’s edge: Greenwich Street once again passing through the landscape of the old World Trade Center site, and West 60th Street, with its accompanying waterfront park in Riverside South. These new boulevards will not necessarily improve automobile transportation, but they will re-knit long-sundered neighborhoods in the city. It’s nice to see that at long last New York policy is taking the urban lessons of Jane Jacobs to heart and giving priority to the experience of people, not goods or cars. A version of this article appeared in AN 17_10.21.2009. Last week, we wrote about Christopher Alexander winning the prestigious Scully Prize. Now, he's been named the third most important urban thinker by venerable planning site Planetizen, after Jane Jacobs and Andrés Duany and ahead of F.L. Olmsted and Kevin A. Lynch. Even Daniel Burnham, who's celebrating the centennial of his eponymous plan was lower on the list. If we sound surprised, it's because many of us here in the office had either never heard of Alexander or long forgotten about him, his heyday having been so long ago. But clearly he is on people's minds, considering Planetizen's list of the 100 most influential urban thinkers comes from a survey of its readers. Perhaps Ned Cramer put it best, when we discussed Alexander's selection by the Scully jury, of which the Architecture editor was a part: "I think it's a lot like Venturi in the 90s, people are really starting to recognize a very influential designer, someone they'd been drawing on for years without even realizing it." Earlier today, the Municipal Art Society posted an incredibly informative presentation that the group gave at the recent City Council hearings on the Bloomberg administration's plans for rezoning Coney Island. The presentation, which can be found above, pretty succinctly explains what's wrong with the city's plan, why it won't work, and alternatives--proposed, of course, by MAS--that could be undertaken. So why has this presentation surfaced so late in the process, when it will have little, if any impact on the rezoning? Rumor has it the group didn't want to rock the boat--after all, they got a warning from planning commission chair Amanda Burden--as the presentation was considered too incendiary for public consumption. Still, it make a far more compelling argument than some loopy renderings. And besides, isn't the MAS supposed to rock the boat? Jane Jacobs would be so disappointed. In her 1961 book, “The Death and Life of Great American Cities,” Jane Jacobs documented and analyzed the urban street life visible outside her home in Greenwich Village, revolutionizing the way people and planners think about cities, urban planning, and development. In honor of her legacy, the preservation group which she helped found, the Greenwich Village Society for Historic Preservation (GVSHP), initiated a proposal for the street in front of her former home at 555 Hudson Street between Perry and West 11th Streets to be renamed “Jane Jacobs Way.” In a released statement by the GVSHP, Executive Director Andrew Berman said, “Jane Jacobs had such a profound effect upon our city and our lives; there are few people more worthy of the honor of having a street co-named in their honor.” Approved in 2006 by the local Community Board and the full City Council, the naming will take effect early next week with the installation of the official “Jane Jacobs Way” signs. Computer rendering of 17th Century Manattan (2008). In the opening pages of Delirious New York, Rem Koolhaas states that the physical form of New York City is the product of a self-conscious urge to rewrite the past in order to serve a particular vision of the future. Writing of the pre-European New York, he asks, “What race first peopled the island of Mannahatta?” Quoting the 19th-century historian Peter Belden, he answers, “They were, but are not,” victims of a vast, fictitious plot in which barbarism gives way to refinement. Split Rendering of Manhattan of today and the 17th Century. Though the exhibition Mannahatta/Manhattan: A Natural History of New York City, on display at the Museum of the City of New York until October, appears at first glance to have nothing in common with Delirious New York, the exhibit self-consciously attempts to influence the city’s future by including the landscape eulogized by Koolhaas. The feat of recreation is accomplished using historic maps and the modeling tools of ecological science. 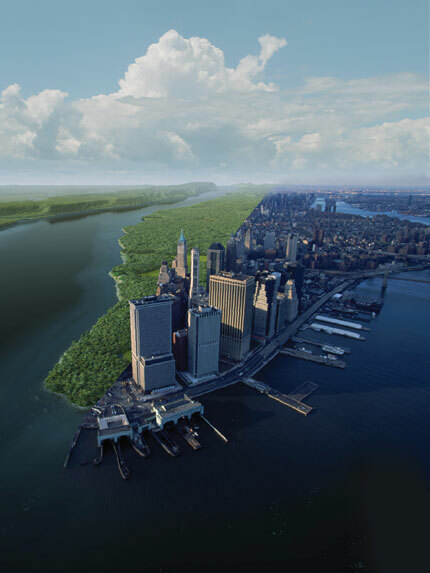 The result is a computer-generated vision of Manhattan as it appears on the sunny September afternoon, four hundred years ago, when Henry Hudson first set eyes on the island. The beautifully rendered images depict a land of abundance covered by pure green forests, washed by clear flowing streams, and ringed by sparkling wetlands: an ideal habitation for both man and beast. Consequently, the exhibit challenges the viewer to see the contemporary city as “a place shaped by the relationship between nature and people.” In order to function as good stewards of this ecological heritage, we, individually and as a society, must realize that the “principles of diversity, interdependence, and interrelativity operate in a modern mega-city much as they do in nature.” The clear implication is that this newfound understanding will enable the people of New York to re-envision the future as a sustainable ecological reality. The exhibit begins with an interactive display. One click and an aerial view of the current urban grid transforms into an image of long-ago ecological abundance. 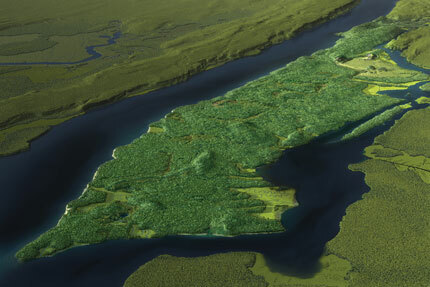 A topographic map of Manhattan dominates the center of the space, and functions as a display screen for the cultural, natural, Native American, and ecological history of the island. But the real heart of the exhibit is a Muir web, a set of computer-generated connections between the ecologies that once composed the Manhattan landscape. In the silence, he wrote, one would not sense the glacier’s “slow, crushing, scrapping, ripping movement as it advanced south, leaving great masses of rock debris in its wake. Under the frozen depths where the carousel now stands, you would not notice the effect on the bedrock as the glacier moved itself along.” Smithson’s vision, carefully documented with historical and Polaroid images of Central Park, oscillates between creation and destruction. Though a less nominally beautiful vision of nature, Smithson’s embrace of destruction as the necessary seedbed for a lively, diverse, and creative growth is perhaps more truthful. Organized by the Graduate Program in Urban Design at the City College of New York’s School of Architecture, Urban Design and Landscape Architecture, the annual Lewis Mumford Lecture has become an intellectual rite of spring for urbanists, architects, and students of both. 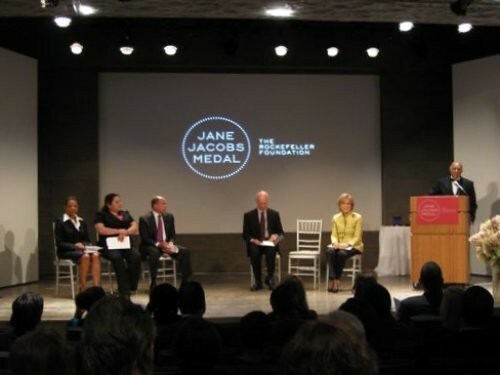 The series was founded in 2004 by Michael Sorkin, the graduate program’s director, and launched with a lecture by Jane Jacobs, followed by an equally inspired roster of speakers including Enrique Peñalosa, the former mayor of Bogotá, Colombia, and David Harvey, the geographer and economic theorist. It was a description that could be applied to the novelist himself. But it was Michael Sorkin’s introduction, reprinted here, that perhaps best pinpointed the liaison between literal and imaginative urbanism. 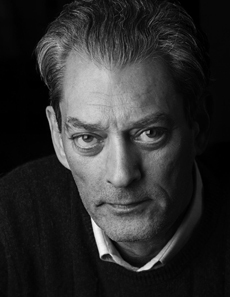 Paul Auster is a master of the topological novel. His remarkable popularity among architects and urbanists truly springs from the spatial preoccupations that infuse his work, a quality it shares with such cartographers as Calvino, Borges, Robbe-Grillet, Hitchcock, Chandler, Kafka, Poe, and other designers of habitats for the nearly ineffable. Each of Auster’s books provides a set of calipers, a measuring instrument for both the palpable and the metaphysical dimensions of space. That space more often than not is New York, an immense Rosetta Stone for decoding motive and meaning. Is there a more direct and compelling image of translation or a more succinct metaphor for the way cities produce meanings than the series of strolls taken by Peter Stillman in City of Glass, in which the blocks of the city become the tablet on which, letter by letter, words are spelled out for the pursuing detective, Quinn? The urban unconscious is structured as language and pattern. Space is character. Despite the seemingly purposeful drive of these two walkers, the pervasive and much-observed importance of chance and coincidence in Auster’s work also firmly links his project to the city. Cities are accident machines, generators of random encounters with people, places, objects, and self. Life as lived or constructed builds a narrative route through this collusion of unexpected and familiar events. Auster has a remarkably fine sense of the Janus of liberation and nightmare that these accidents engender. His power as a storyteller is both in constructing a singularity—one passage through time, space, and emotion—and in throwing it into radical doubt, a condition of unreliability that loops back to reveal the ultimate unknowability of the city itself. That Auster’s work so teems with allusion and filiation and with the intertextual also evokes a remarkably urban condition. The clarity of Auster’s own relationship to specific forms, incidents, and authors refracts this recombinant urbanity into colors both strange and familiar. Behind this spectral variety, there is an umbra of noir. Auster’s deep immersion in the detective novel does not simply produce a city as a set of suspicious behaviors, clues, dead-ends, and pregnant enigma; it locates it at the crumbling reaches of modernity, the limits of the rational city produced by the fragile clarities of deduction. As with any confirmed New Yorker, Auster fills this landscape with scenes of alternative “life styles,” roadmaps to escape. In his frequent evocations of Thoreauvian isolation and self reliance—snug houses in Vermont, caves in the Western desert, concealing thickets in Central Park, imaginary countries in South America, or just cars on the road—his novels are deeply utopian and constantly threaten, as utopias will, to lapse into nightmare. Walden easily becomes the Unabomber’s hut. Auster is brilliant at evoking our contemporary urban dystopia: lives without money, confined to single rooms; the stable balance of human relations torn apart or imprisoned by numbing regularity. He is a lapidary recorder of our anxieties, from the petty annoyances of the everyday, to insomniac nights, to the maw of loneliness, to the scary fluidity of identity, to the always lurking possibility of cataclysm. Perhaps the reason so many Auster characters wind up in Brooklyn is the search for that elusive mental Arden that the borough seems to represent, a touchstone of the author’s fundamental optimism. Auster inhabits our city, its bars and stationers, bookshops and subways, its parks and sidewalks, its Chinese restaurants and candy stores, with a typical New Yorker’s sense that in the recursive folds of the city, the universe is embedded. And it’s a universe and a city that produces not just fear and trembling but sublime joys, the intensities of love and friendship, the pleasures of the street, the satisfactions of a cup of coffee or a good cigar—the happy accidents that are the great gifts of good city life. Auster reads the city to write it; he is one of our most creative urbanists. Robert A.M. Stern, dean of the Yale School of Architecture and the head of an expansive New York practice, was recently awarded the tenth Vincent Scully Prize given by the National Building Museum (NBM). The award was established in 1999 and recipients have included Jane Jacobs, the Prince of Wales, Phyllis Lambert, and the Aga Khan. It has been a banner year for Stern: Along with the Scully Prize, he was recently chosen by President George W. Bush to design his presidential library, he won a rave profile in Vanity Fair for his luxe condo high rise 15 Central Park West, and he oversaw the rededication of Yale’s once-dilapidated Art and Architecture Building as Paul Rudolph Hall, named for the building’s designer who was also Stern’s former teacher and predecessor as dean. The award is also something of a vindication for Stern, who came to his New Haven deanship a decade ago amid griping that he would, like his immediate predecessors Thomas Beeby and Fred Koetter, sacrifice his academic role for the lucrative returns garnered by his firm, Robert A.M. Stern Architects, which had cornered the market in crowd-pleasing, historicist design. Indeed, while Stern had developed a national reputation as an academic and a practicing architect, if he was famous he was also infamous, and increasingly pigeon-holed: as a narrow-minded historicist, as a political reactionary, as a corporate architect who enjoyed the art of the deal more than the art of building. 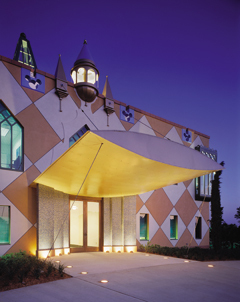 He sat on the board of directors at Disney, even as he criticized architects he thought too enthralled with trendy styles and ideas. “There were many on the faculty who wondered, wasn’t Bob a little too strong-minded to be dean,” admitted Levin at the Scully Prize gala dinner, held in the NBM’s cavernous central hall in Washington, D.C., on November 13. Stern did a particularly good job importing full-time and visiting faculty who clashed with his own conservative views on architecture, including Peter Eisenman, Zaha Hadid, and Greg Lynn. 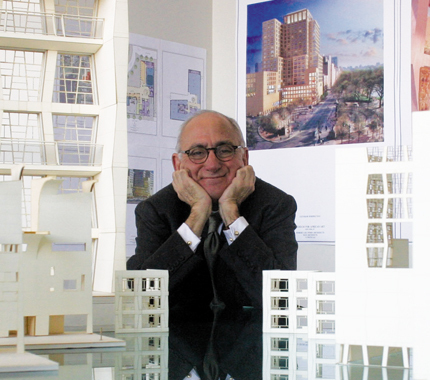 “He made it clear that a school of architecture cannot be a dean’s studio,” said Levin. He has managed to do all of this without sacrificing his practice. 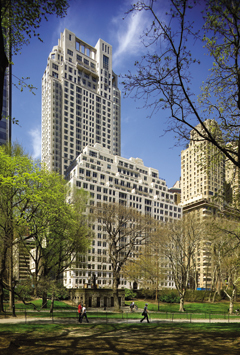 He has nearly doubled his firm’s head count to some 300 and completed a series of blockbuster projects, including Philadelphia’s Comcast Center and 15 Central Park West, with another Manhattan tower, 99 Church Street, in process. 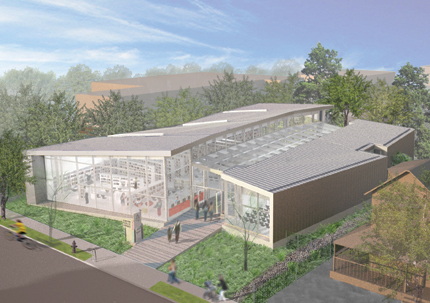 He was also recently picked to design two new residential colleges at Yale, the university’s first since the 1960s. Stern is still not without detractors in the architectural world, though few are willing to go on the record, even anonymously, a reflection of the enormous influence he wields. While some of the criticism is aimed at his ability and aesthetic opinions as an architect—writing in New York, Justin Davidson called Stern “an architect who specializes in the best nostalgia that money can buy”—much of it is political.